Open House and Mead Tasting in the New Year! Free Event - Open to All People Interested in Wrought Academy! Free Event to Promote Wrought Academy / All are Welcome! We're celebrating the beginning of the 2019 teaching year at Wrought Academy. If you're curious about the shop and the classes offered at Wrought Academy this is your chance to drop by and see what's going on! We will be forging throughout the day to give you an idea of some of the skills taught here. Class projects will be on display as well as pieces from Jim Austin's collection of forge work and tools. 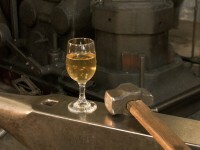 Mead Tasting will offered for those of you (adults) interesting in trying the house sparkling mead. This is a clear, semi-sweet mead fermented from light, wild-flower honey. It is descended from the ritual drink of old Norse royalty and was served at feasts in the Mead Halls of Scandinavia well over a thousand years ago. Class Description: In this class we start with the basic blacksmithing skills which will set you on a path to forging the hardware, decorative articles and tools which were common throughout the Iron Age. These items were essential to our ancestors and were often forged with exceptional quality and striking beauty. All of this will inform our work. Class space is very limited! Students will be registered in the order that their payments are received. All necessary tools and materials will be provided for the students. Students must bring their own safety glasses and wear them at all times in work areas (a few used pairs are usually available at the shop). Students must wear snugly fitted, long-sleeved work shirts and long pants of cotton or wool (no nylon or polyester allowed) and firm, leather work-shoes. Hearing protection is required and is provided in the shop in the form of foam ear-plugs. Students who need over-ear protection must provide their own. 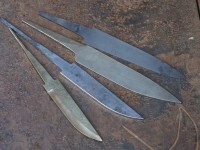 Class Description: This class will focus on the forging skills essential for producing medium-sized, utility knife blades. As students gain experience they will each start working in high-carbon steel and forge a knife blade which they can grind and heat treat. Emphasis will be placed on proper working temperatures at all stages of production as well as efficient and accurate hammer work. The skills learned will be directly applicable to the more advanced classes we offer in pattern-welded and laminated knife forging. 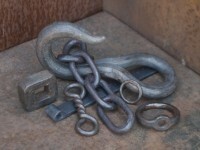 Hone your basic forging skills by making the simple yet essential articles of hardware (such as hooks, rings, chains, and hinges) that would have been common in any early European town or settlement. 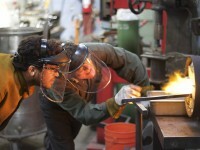 Class Description: In this class we will continue with more core blacksmithing techniques such as punching, hot-cutting and heat treating which are not covered in Basic 1. 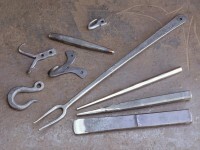 These techniques will introduce the students to new forging concepts and tools which lend themselves to both tool-making and decorative blacksmithing.